September 2015 – THE BOOKS THAT TIME FORGOT. Willie the Visitor that joined the human resistance comes to the small town of Cutter’s Cove, Maine. He is there to volunteer himself as a guinea pig in experiments. Dr. Randall Brunk has come up with a possible toxin that could drive the Visitors off the planet. After being saved from a lynching by the townspeople by Pythias Day the new sheriff the two head out to Dr. Brunk’s lab outside town. When they get there they find Brunk and his assistant have fled a squad of Visitor shock troops lead by Ronald. He is also there to get Dr. Brunk’s formula. Pythia’s manages to escape but is too late to save the men of Cutter’s Cove as they are treacherously lead into an ambush by a traitor. Now Pythias must form some sort of resistance to stop Ronald. 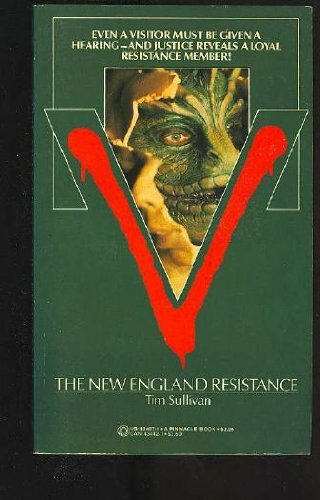 The second book by Tim Sullivan is another weak addition to the series. While it starts out ok it soon descends into his trademark goofy rituals he comes up with for the Visitors. In this case Ronald performs an ritual where he hunts Willie on a small island. Its something that just drags the story along without any excitement. Also he throws in two hunters from New York who I guess were supposed to be comic relief but were more annoying with their whining. Oh and the stilted dialogue , cardboard characters and general hackneyed plot make it a less than interesting read. Sullivan was the weakest writer in the series. The resistance in Chapel Hill, North Carolina have successfully infiltrated and bugged the offices of the Visitor HQ in the research park. This new intelligence source has revealed a Visitor research program. Leon a Visitor biologist is conducting experiments on Crivits in the area. The goal seems to be to release them into the wild. Crivits are sort of land sharks from their home world. Traveling through sand the Crivits will reach up with their tentacles and drag down their prey. Carnivorous and quick breeders the Crivits could spread all along the eastern seaboard and cause untold damage to lives and the economy. Now the resistance must mobilize to stop this threat. The Crivits were introduced in a TV episode as sort of guard dogs for prisoner camps. Allen Wold writes a solid story that is filled with intrigue. The actual threat is not the Crivits which was an interesting twist at the end. If there was a weakness in the story it is that the Visitor occupation is portrayed as very benign. Life seems to be going on as normal. People going to work. Stores and restaurants don’t have any shortages. The university is still functioning as usual. Indeed the Visitors presence is confined to random checkpoints were they search the cars and check IDs. They seem to be more of a nuisance than sinister. If you are going to have lizard Nazis from outer space they should act like lizard Nazis from outer space. This was the second of three books that Allen Wold did for the series. All of them were solid entries with an enjoyable story. I was never disappointed when I saw his name as the author. Tomoko Jones is a Japanese-American anthropologist who is studying the Ainu when the Visitors kidnap the village for storage aboard the Mother Ship. She is revived to be the consort to Fieh Chan the commander of the Tokyo Mother Ship. Well before anything can happen the red dust is released into the atmosphere. Fieh Chan throws Tomoko into a skyfighter and they escape but are forced to parachute out. Tomoko assumes that Fieh Chan didn’t make it and heads back to California. Four months later Tomoko makes it back to her husband Matt Jones. Matt is a karate expert and runs a school in a strip mall in suburban Los Angeles. He has taken in a twelve year old boy named CB who lost his parents to the Visitors during the occupation. Just then Matt gets a cryptic message stating “Beware the Alien Swordmaster is Coming.” He thinks its a prank until other martial artists across the country are being kidnapped after receiving this message. 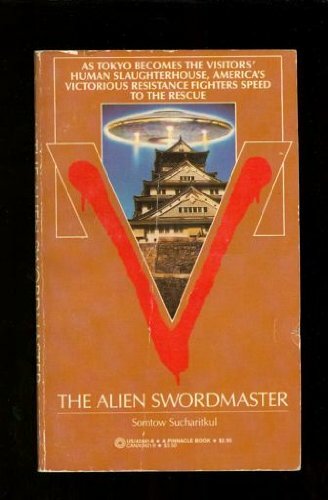 He is almost taken by Visitor ninjas when a mysterious swordsman saves him. Kenzo Sugihara is a master swordsmen from Japan. He has news that not all the Visitors were driven off by the red dust. Fieh Chan had developed molecular pressure suits that can protect the Visitors from the dust. A number were stranded when the Mother Ships left in Japan. They were able to maintain control over the converted Japanese government officials and still rule in Japan. They have converted the country into a feudal society isolated from the rest of the world. The leader Lady Murisaki is building an army of converted Ninjas. Since the martial artists in Japan committed seppuku rather than be converted, they have to kidnap them then outside Japan. Kenzo enlists Tomoko, Matt and CB and the three go to Japan to put an end to the Visitors reign of terror. This is one weird book. I had a lot of problems with it. First the molecular pressure suit. A plastic that covers the body and lets in oxygen but keeps out the red dust. But what about the mouth? The Visitors eat a lot and apparently have no trouble eating what should be contaminated food. Also the plan to build an army of ninjas. I didn’t see what the purpose was. They wouldn’t fare very well against opponents with guns. And I also had a problem with the rest of the world not noticing and doing something. Oh and of course the cliché of dragging along the pre-pubescent teen on a dangerous mission. Is that ever a really good idea? And a reveal that I saw coming a mile away, Fieh Chan was Kenzo Sugihara. The book had a really grim tone what with all the Zen suicides and Visitors eating people all the time just puts this book as one of my least favorites in the series. The Los Angeles resistance has scored a victory against the Visitors. They have successfully liberated three intelligence agents right out from under Lydia’s nose. Now they have to figure a way to get them out of Los Angeles and back to their homes. Mike Donovan, Ham Tyler and Chris Faber have a plan to return the Japanese agent back to his country. Taking him to a small town of Crows Fork they will meet their contact to smuggle him out of the country. Unfortunately Lydia the security chief that lost the prisoners has found out the plans. Now the three resistance fighters are trapped in the small town. Lydia threatens to execute the townspeople until the resistance fighters are turned over. While this goes on the other members are trying to smuggle weapons up from Central America and gain secret battle plans from the Fifth Column. 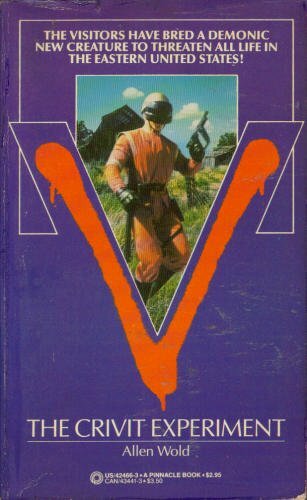 The first book based on the TV series. If you remember the series it was sort of a mess. Rushed into production to capitalize on the success of the mini-series. It used way too much stock footage, had pointless fight scenes, killed off or abruptly dropped popular characters and seemed to have no idea in what direction to take the story. Still I liked it. I thought it had great potential if given time. Howard Weinstein having just read the first few scripts has managed to weave a really exciting an believable story. The characters come alive and the situations are believable. I wish that he was the one who wrote for the series. I think him and other writers of these books could have made it a success. This book gives a glimpse into what the series could have been like. Weinstein is my favorite author of the series and all three books he did were the best of the series. It is several months after the Visitors have left and things seem to be back to normal. Jack Stern a football player for the Miami Dolphins is worried about his finance Sabrina Fontaine. A biologist she has disappeared after accepting a job with a new company. While searching her home he comes upon two guys ransacking the place. The two are Ham Tyler and Chris Faber CIA agents and former resistance fighters. They tell him that Sabrina has been taken by the Visitors. This leads the three to a secret Visitor base deep in the Everglades. The head Visitor scientist Dr. Morrow has found a antidote for the red dust. He also has been conducting experiments on creating a human-alligator hybrid to be used as a super soldier. If that isn’t enough he also wants to mate with Sabrina and create another hybrid star child. Now the three must organize a resistance among the local Seminoles and swamp rats to destroy this new threat. Another book written before the series format was known. I always found Tim Sullivan to be the weakest of the writers in this series. While it is an interesting read, after such quality books that came before this you can’t help but be disappointed. He tends to take a more campy approach with his interpretation. I mean who would build a gladiatorial arena at a secret research facility in the swamp. It does get used. A sheriff is forced to fight the alligator hybrid. Two clone Visitor soldier that are disgraced fight to the death with serrated swords. Oh and at the end they blow up a Mother Ship way too easily. This would be the first of three books that Tim Sullivan would write for the series. This is actually the best of the three. It is V-day and an armada of small aircraft and balloons fill the skies over Chicago. At the same time Gerald a Visitor commander leads a strike force of 200 shock troopers on a raid of the resistance headquarters. He finds it deserted but recovers a bag with 200 pills labeled anti-toxin. He quickly distributes the pills to his troops hoping to win a great victory over the resistance and gain glory for himself. But its too late and he is ordered to pull back as the Visitor fleet flees the planet. Alicia the commander of the Chicago Mother Ship is quite angry because Gerald used all the pills instead of saving some to be reproduced. They can’t isolate the anit-toxin in the blood stream. Still she comes up with daring plan. She will use the immune shock troopers to kidnap the leaders of the resistance in Chicago and convert them. Thus she will establish a foothold back on Earth. A week later finds Samuel Walker a disillusioned Vietnam vet still hiding out with his girlfriend in the abandoned suburb of Arlington Heights. Since the Visitors emptied out the suburb the two have been in hiding only coming out at night to scrounge for food. On one such trip they meet their resistance contact Janus Brodaski an old veteran of the Polish underground during WWII. He tells them of the victory and Walker and his girlfriend start to think about the future. Unfortunately his girlfriend wanders into the immune shock troopers and is killed. Now Walker and Janus are the only two that know of the immune Visitors and must somehow convince the resistance before Alicia’s plan succeeds. 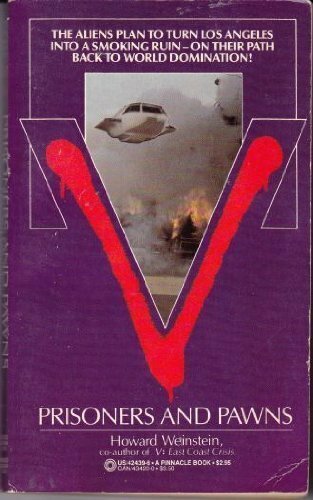 The second book for the new TV series written without any knowledge of what the show would be like. Here Proctor decides to also pick up the story right after the Final Battle mini-series. He sets it in Chicago so we get to explore another different city. I found this to be a really interesting story. 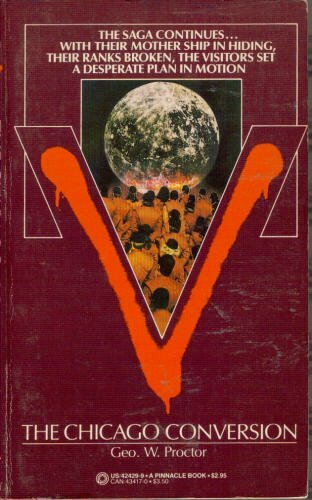 Proctor is a good writer and would go on to write one more book for the series. This is what I always liked about the book series. It would explore other parts of the world. This and Pursuit of Diana really got me hooked on this series and I couldn’t wait for the next one due out next month. The Visitors have been defeated by the red dust. Diana’s plan to destroy the Earth by setting off the Los Angeles mothership has been stopped thanks to the mysterious powers of the alien hybrid Elizabeth. Now Donovan, Parrish and the other members of the resistance and Fifth Column are facing the aftermath. The mothership engines are damaged from it’s quick exit from the atmosphere. On board are many Visitors that are quite hostile to the resistance/Fifth Column takeover of the ship. They must somehow repair the engines while insuring there isn’t a Sixth column resistance among the Visitor crew. On Earth society starts to settle in to a post-Visitor liberation. While on the surface it appears that society is moving on there are some serious problems. The world’s leaders at all levels were converted by the Visitors brainwashing techniques. Now puppets that had their strings severed the leaders are giving erratic and contradictory orders. Into this Diana the sadistic Visitor leader enters into an alliance with a power hungry National Guard colonel. She will use her influence over the converted leaders to reestablish Visitor control over the Earth. Now the resistance must stop her before their hard won victory is undone. 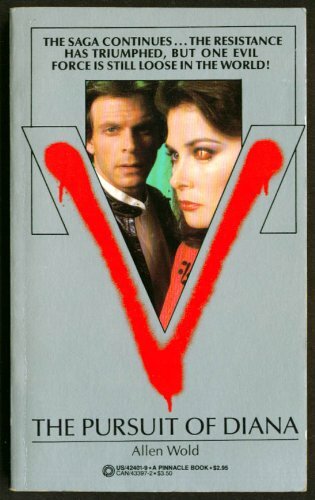 When it was announced that the mini-series would become a regular TV series Pinnacle decided to do a series of books. Of course they had no idea what the TV series would be but wanted the books on the stands by the time to series came on air. So the first three or four would have to be quickly written and the authors were on their own in figuring out on how the series would go. Allen Wold decided to pick up the story right after the Final Battle mini-series. He did a pretty good job of coming up with a plausible continuation. It continues seamlessly from the mini-series ending and has all the surviving characters. 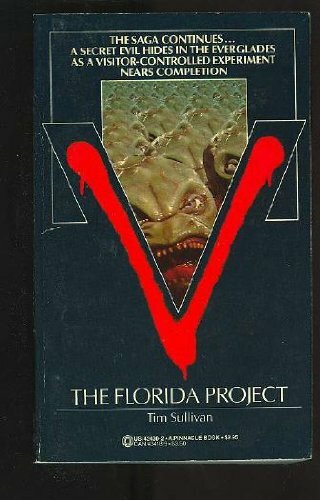 This was the first V book I read and it got me hooked on the series. Allen Wold would write two more after this and all of them were well written.